For the past six years, the St. George neighborhood of Staten Island in New York City has been anxiously awaiting the arrival of what would be one of the city’s greatest landmark attractions: the giant, 630-foot New York Wheel with views of the New York Harbor, Statue of Liberty, and New York City skyline. While over $400 million has been sunk into the project since its conception, little has been done to get the ball rolling. Construction has barely begun, and Mayor de Blasio recently signaled that it may not ever happen. The main problem is the cost. The New York City Economic Development Corporation reported that the estimated cost of the Wheel has skyrocketed from $250 million when the project was first proposed in 2012 to a devastating $999 million under the de Blasio administration. When the Wheel’s developer, New York Wheel LLC, asked the city for $140 million in support, de Blasio rejected their pleas, refusing to bail out the floundering project. His administration told New York 1 that the city government is “clear-eyed about the risks of putting public money into an expensive, speculative project.” The New York Wheel promised to transform the humble yet densely packed neighborhood of St. George into a world-class, waterfront destination. Aside from the Wheel itself, whose 36 spacious and climate-controlled pods would provide visitors with fine food, drink, and breathtaking views of the city, the site also comprises five acres of publically accessible grass space for events, a state-of-the-art children’s playground, and a terminal building with restaurants, shops, and boutiques. The project would have potentially revitalized Staten Island, a borough that has long been neglected by New York City tourists. Yet the government’s decision to oppose the funding of the New York Wheel comes after a surge of similar projects in cities like Berlin and Beijing that eventually failed due to a lack of support and income. “Despite many recent conversations with the Wheel developer, we remain convinced that public funds are too scare and valuable to be leveraged for this venture,” an official with the Economic Development Corporation told New York 1. Since the Wheel’s developer and former contractor, Mammoet-Starneth, hoped to rely on the city for financial provision, the two parties were forced to craft a new deal that would give the development team until January 7, 2019 to hire a new contractor and complete the project. According to Staten Island Advance, a hearing on a motion to approve the agreement has been set for September 21. Until then, the fate of the Wheel remains unknown. After delays of almost a year, Staten Island's giant Ferris wheel is finally back on track. Earlier this month, the aggrieved parties reached a deal in court that allows construction on the New York Wheel to move forward. The New York Wheel hired Holland's Mammoet-Starneth to design and engineer the 630-foot-tall North Shore amusement, which sits steps away from the ferry drop-off in St. George. According to the Staten Island Advance, the company left the job on May 26, 2017, and it filed for bankruptcy five months ago. The New York Wheel fired Mammoet-Starneth from the job soon after. The two entities started mediation in March, but they weren't able to come to an agreement in court—until now. 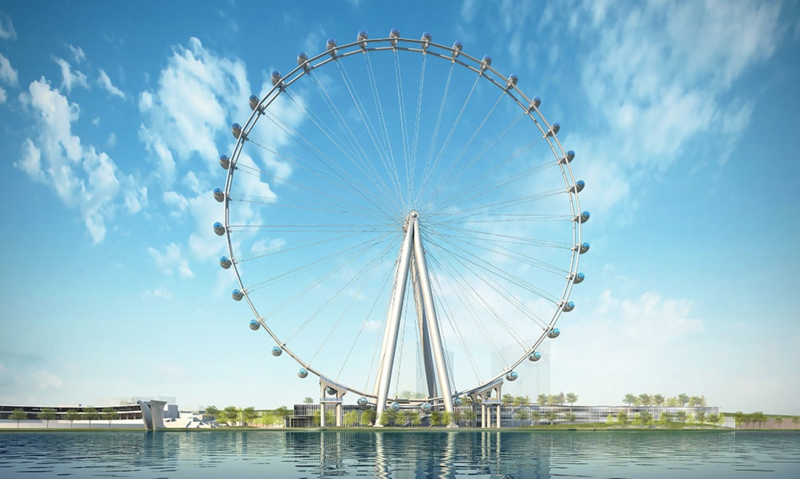 Among its key provisions, the new agreement vacates the lawsuit between the two companies and lets the New York Wheel hire a new contractor to finish the job. It has selected American Bridge and ARUP, the construction company and the massive engineering firm, respectively. Per the agreement, the New York Wheel has until early September to scrounge up financing for the venture—and it can cut loose from the deal if it can't find the money. So far, the company has raised $400 million of the wheel's $580 million estimated cost from investors, but at this point the New York Wheel is mum on how much of that money has been spent. On the New York Wheel's website, S9 Architecture and Perkins Eastman are listed as the architects behind the project. The wheel is supposed to be a supposed to be a draw for New Yorkers and tourists alike, many of whom are predicted to descend upon the adjacent Empire Outlets, the city's first outlet mall. SHoP Architects is designing that complex, which is slated for completion this fall. The New York Wheel may be back on track. The giant Ferris wheel on Staten Island made news last month when it was revealed that wheel designers Mammoet-Starneth left the job after a pay dispute with the developer, New York Wheel LLC. Apparently, the firm is in "advanced negotiation" with another company to get the ball rolling (wheel turning?) again. To finish the project, the developer has partnered with the American Bridge Company, the same folks behind the new Tappan Zee Bridge, the Las Vegas High Roller observation wheel, and the Empire State Building, way back in the day. "As part of that transition, the cranes previously provided by Mammoet are not required and will be removed from the [project] site in order to make way for replacement equipment," said Cristyne Nicholas, spokesperson for the New York Wheel, in an emailed statement. She added that work on the terminal building is ongoing and that the New York Wheel will announce a new completion date "in the near future.” Stay tuned. As construction continues along the North Shore of Staten Island, the New York City Economic Development Corporation (NYCEDC) released a report this week detailing “never-before-seen” levels of investment in the area, totaling $1.6 billion. The figure includes $1 billion of private capital alone and an additional infusion of $600 million in public funds. The North Shore redevelopment project, particularly along the St. George waterfront, is anchored with several notable projects like BFC Partners’ Empire Outlets designed by SHoP Architects and the New York Wheel, a Ferris wheel that will stand 625 feet over the harbor. The report also touts updated numbers on the economic impact of the proposed North Shore transportation and tourism hubs, with the NYCEDC estimating that those projects will attract 2 million tourists annually, increase housing by 4,000 units, and add over 2,000 jobs to the local economy. Lighthouse Point, a mixed-use development with a museum, is a large contributor to these statistics as well as the borough's investment in a startup incubator and marker space further south in the Stapleton neighborhood. Most elements of the North Shore plan will open in early 2018. 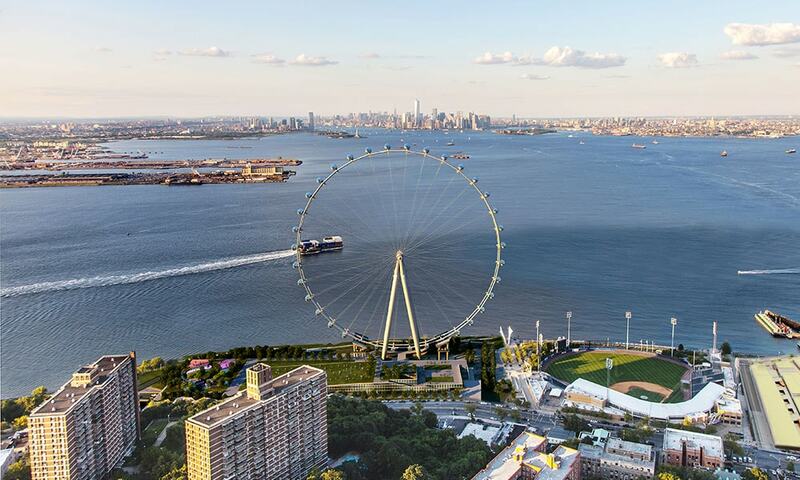 Architecture firm S9, a division of Perkins Eastman, is moving ahead with plans for the New York Wheel, what will soon take shape as an enormous Ferris wheel on the Staten Island waterfront. https://youtu.be/eeIobTnXp-4 According to development watch-blog Yimby, construction cranes have appeared on the Staten Island site of what will one day be the largest Ferris wheel of its kind in the Western Hemisphere. Perkins Eastman says the wheel is "designed as a composition of geometric forms clad with vertical terracotta fins, strategically interrupted by terraces, ramps, and stairways that are inspired by the juxtaposition of the surrounding foliage and the rock formations at the Palisades Sill" The wheel design and manufacturing will be fronted Mammoet-Starneth, which specializes in giant wheel construction. The company also worked on the London Eye, built along the River Thames in 1999. Additional plans for a similar project in Dubai are also in the pipeline. In 2012, the London Eye was, according to David Marks of Marks Barfield Architects, "the most visited paid-for attraction" in the UK and third in Europe after the Eiffel Tower and Disneyland Paris. 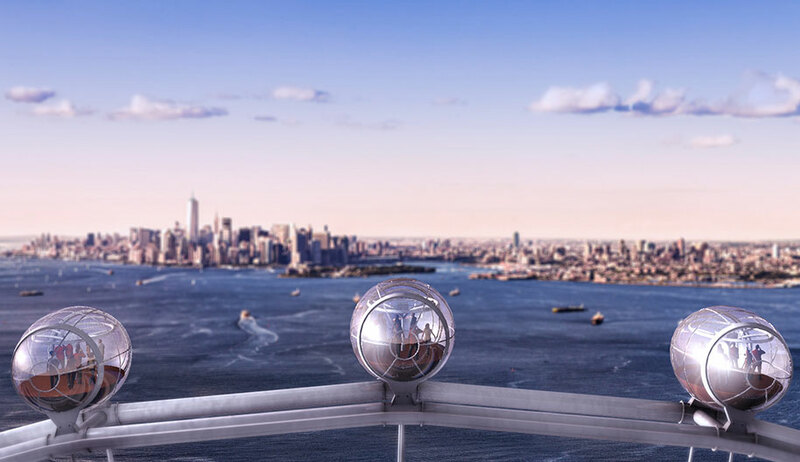 The New York Wheel has similar aspirations, but its success hinges on whether visitors will opt to take the five-mile, free ferry ride from Lower Manhattan. Keeping tourists on Staten Island has been a long standing issue for New York City officials, according to the New York Times. "Every year, two million tourists ride the Staten Island Ferry, and yet most of them never leave the terminal," the newspaper reported. Aiming to be open seven days a week and 350 days a year, the wheel would operate from 10:00a.m. through 10:00p.m. or midnight, staying open until 2:00a.m. on special occasions. It can also accommodate up to 1,440 people per ride which the New York Wheel website equates to over four million rides a year. This will be made possible by the deceptively large "pods" that will carry up to 40 passengers each up 630 feet into the sky giving them an uninterrupted view onto manhattan and over the island. The pods will be predominantly glass which should facilitate sweeping panoramic views and be safely secured to the wheel itself by what looks to be a steel structure. 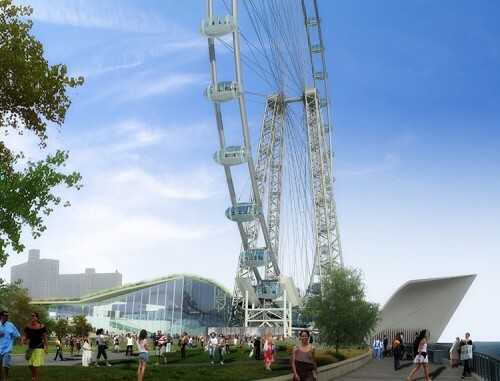 Similar to the London Eye, the New York Wheel will resemble that of a bicycle wheel when viewed from distance. Though it is not known yet, Starneth is likely to emulate the ever-moving structure in London which traveled at a leisurely 0.6 mph. During the London Eye project, Marks told WNYC that getting financial backing was the toughest part of the project. However, Rich Marin, president and chief executive of the New York Wheel, told the New York Times that this will not be an issue for the wheel. Goldman Sachs is funding the project with $130 million in capital. The landmark wheel isn't the only project set to adorn the island's North Shore Waterfront. 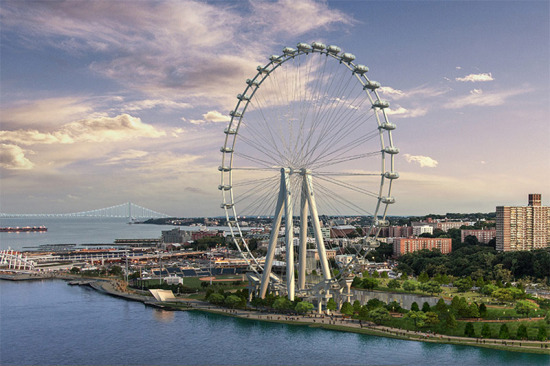 Covered by AN in 2012, the wheel will be accompanied by a 1,100 square foot space for Empire Outlets by SHoP Architects in collaboration with Lee Weintraub Landscape Architects. According to New York Daily News, the outlet will be home to household names such as "Nordstrom Rack, H&M, Gap Outlet, Banana Republic Factory Store, Guess Factory Store and food options such as Starbucks, Nathan's and Applebee's." At a ceremony in April, Donald Capoccia, principal at BFC Partners, the developer behind the outlet project said, "Empire Outlets is a well-timed catalyst that will trigger the transformation of the North Shore and position Staten Island for sustained growth into the foreseeable future." The New York Daily News reported that developer BFC Partners and the New York Wheel will be required to cough up "$2.5 million a year in rent to the city for the land and pay $300,000 to maintain the area, including the waterfront esplanade." The planned giant Ferris wheel in Staten Island—one of kookier of the Bloomberg-era megaprojects—is apparently still happening. Eavesdrop always thought the step-Borough deserved more than a tourist trap wheel and a giant outlet mall, but hey, apparently Amanda Burden thought differently. According to the Associated Press, New York Wheel CEO Rich Marin said the project will include a thrill ride that will “simulate a ride in a subway car.” Here’s a better idea: buy a MetroCard. It is official. 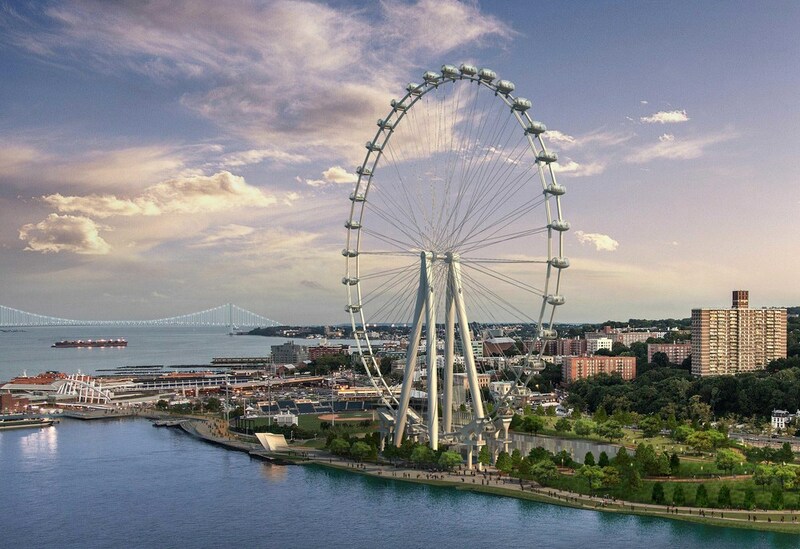 The world's tallest Ferris wheel will rise on Staten Island's waterfront. Today, New York City Council approved the New York Wheel, a mixed-use development project, designed by Perkins Eastman. The project will include a 100,000-square foot Terminal building in addition to retail, restaurants, open space, entertainment, and a 950-parking garage. The structure will implement green design strategies and feature wind turbines and solar panels. Construction will commence in 2014 and be completed by 2016.